title="How many points do you get for dunking every basketball in existence at once?" If the earth were the size of a basketball, its gravity would be way too weak to hold onto air, water, or keep the moon in orbit. If it was the size of a basketball and still weighed 5.97x1024 kg, it would explode like a small supernova (*). If it was the size of a grape (smaller than the 9mm Swartzchild radius), it would implode into a black hole. Basketball-sized planets can be very dangerous. (*) added note: that would (very briefly) be a billion times denser than a neutron star - it would be an ultradense quark star, and might explode into a shower of pions. Astrophysicists are still arguing about quark stars, but one possibility is that it would become neutral pions, which decay into gamma rays, near-complete conversion of matter to photons? Sounds like a good what-if. Last edited by keithl on Wed Apr 22, 2015 6:08 am UTC, edited 1 time in total. I'd love to see the continental drift patterns on an Earth with basketball-seam plate tectonics. 1) isn't this pretty much the ending to Men in Black, among many other things? 2) it might be something to do with Earth Day. So, according to W|A, this object is 39 kg. Not sure I want to meet the cat who can casually bat it around. Would be a challenge to hoist 8 or 9 feet into the air, too, as in the last panel. To say nothing of dunking it. The answer is 2 points. Read My Book. Cost less than coffee. Will probably keep you awake longer. In the second line: ketchup or mustard? Scientists are divided. Definitely mustard. Read the whole of 1190:Time for an explanation. The question in the alt-text isn't the right one to be asking, it should be "How many points do you get for the remaining basketballs on Earth after at least the majority have been thrown off due to the force of the dribbling?". Otherwise, she's throwing from inside the three point line so it's at least 2. 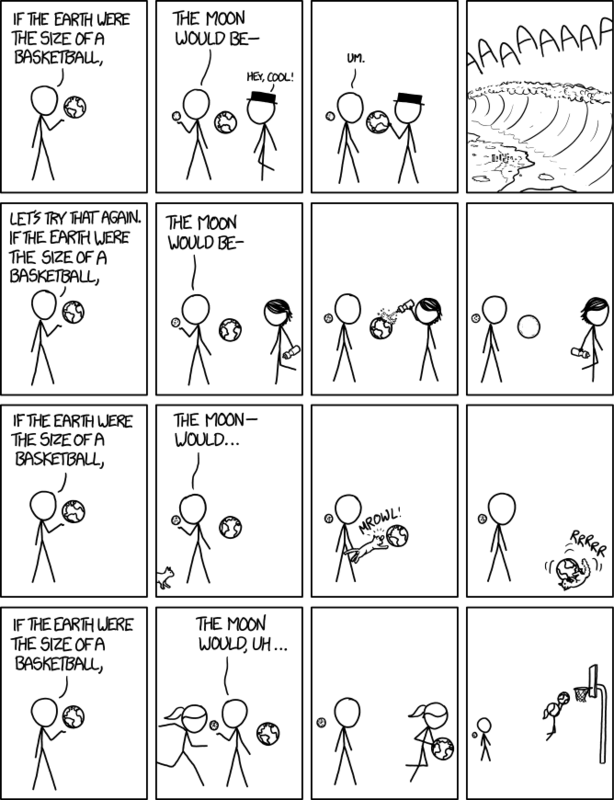 In the first panel, is BHG pushing the Earth closer to the Moon to create ridiculous tides? Or is he just poking the ocean to watch the pretty ripples? The preceding comment is an automated response. ...be taunting it mercilessly for being such a tiny worthless planet with delusions of significance. It would also orbit the moon instead of the moon orbiting it.Not withstanding that the path of the moon can be interpreted as orbiting the sun and not the earth. snowyowl wrote: In the first panel, is BHG pushing the Earth closer to the Moon to create ridiculous tides? Or is he just poking the ocean to watch the pretty ripples? Ah, maybe. It seems like the big wave should really go with the second intervention, which looks like she squirts enough water to submerge all of the land. I don't really get this. Why don't we get close-ups for the other interventions? Is each character's action supposed to be a comment on their personality type? In that case, why is BHG's act the most benign, and lacking the psychological element he normally exhibits? How is the Earth levitating in mid-air? Also, are there really no basketballs that aren't on the Earth? Has nobody taken one into space? The Apollo programme really missed a trick there. Maybe that's what the late, great Gil Scott-Heron was really getting at in his Whitey on the Moon. "Y'all spent millions of dollars to go to the moon, with one-sixth gravity, and didn't even pack a basketball?" Who says "every basketball in existence" is necessarily still on planet earth? a quick google-image-search for "space basketball" shows that at some point at least one of them wasn't. Further research into this topic is needed. That definitely leads to a "What if" question: How many basketballs are there on Earth? Actually, if we were to make a single basketball using all the material used in every basketball on Earth, how big would it be? Would it be the size of the Earth? This actually leads to a "What if" question: How many basketballs are there on Earth? Actually, what would be the size of a basketball made with all the material of every basketball on Earth? Would it be the size of Earth? If the Earth were the size of a basketball made with all the material of every basketball on Earth...? Now I'm lost. That said, I flat don't understand the squirt bottle thing. Envelope Generator wrote: In the second line: ketchup or mustard? Scientists are divided. I'm sure I know which (ketchup or mustard) the OTTers would pick. My interpretation of the squirt bottle is that she sprayed enough water onto the Earth that the ocean level rose and covered all the land, so now it's featureless. Although an Earth with no land would have some pretty gnarly waves. ps.02 wrote: So, according to W|A, this object is 39 kg. Oh, right. It is mostly iron and other metals. neoliminal wrote: The answer is 2 points. Or zero. I assume the refs are supposed to stop play if there are that many balls on the court at once. Or if one of them is a hypothetical planet and not a regulation basketball. What I want to know is what would the Moon be? Assume that the Moon is reduced by the same scale factor as the Earth, without any direct effects on either so long as no-one touches them. Glad I looked at this on my computer later. This morning I checked the comic on my phone and could only see the left hand side of comics and it made no sense whatsoever. Interestingly the tolerance on the official tennis ball diameter is greater than that on the basketball, so any legal basketball would produce a Moon that was a legal tennis ball (in size, anyway). If the above comment has anything to do with hacking or cryptography, note that I work for a PHP security company and might know what I'm talking about. "Basketball is a peaceful planet!" And the bonus comic is found by reading all the rightmost panels going down. If the earth were the size of a basketball, the moon would be a tennis ball, about 24 feet away. The sun would have a diameter of about 29 yards (or 26 meters), and be 1.75 miles (or 2.8 km) away. If my calculations are correct, it would take 4.14 ounces (or 123 mL) of water to cover Mount Everest. That stepped cylinder shape is a bicycle water bottle. Megan squirted a thin layer of extra water on basketball earth - enough to cover all the continents up to the mountaintops - which show as a few gray pixels around the edges. What's the matter, Cueball? Cat got your planet? Does anyone else see the extra pixels that appear to be special characters in frame (1,4) (wave panel)? Looking in the bottom left quadrant. I like Randall's use of this comic. It provides a subtle psychological look at a few of his characters. I agree with a few of the others: I wish he had provided a close up on the last 3 rows. trpmb6 wrote: Does anyone else see the extra pixels that appear to be special characters in frame (1,4) (wave panel)? Looking in the bottom left quadrant. alanbbent wrote: And the bonus comic is found by reading all the rightmost panels going down. According to Quantum Conundrum, Sputnik was replaced with a basketball, so there would still be one basketball left undunked. Last panel: She lay up us the all of it. "The moon would, uh, start orbiting me?" pierreb wrote: Last panel: She lay up us the all of it. Thanks to what-if, we know that if the earth were the size of a basketball, it would make a poor bowling ball because it would be too rough.